Synthetic rubber became a precious commodity during World War II when imports of natural rubber from the Far East were cut off. Indeed, natural rubber became so rare in the United States that gasoline was rationed to discourage people from driving cars (which, of course, ran on rubber tires). Ultimately, the nation spent as much on its rubber program as it did on the atomic bomb. NIST helped win the rubber battle in several ways. As the government purchased any natural rubber it could find from South and Central America and Africa, NIST set up a lab to test and grade these rubbers and helped the Brazilian government organize its own lab to do the same. The U.S. government also organized a consortium to study synthetic rubbers and invested in the construction of 15 production plants, which had to produce rubber that met uniform specifications. Prewar NIST work on the thermodynamics of rubber suggested which types of synthetics to use and how to test them. Beginning in 1943, the Institute helped standardize both physical and chemical testing, resulting in a notable improvement in the accuracy of rubber testing. 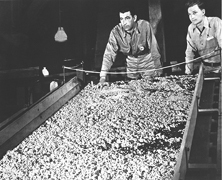 NIST also helped develop tests (such as the use of freezing points to determine material purity) and improve instruments (such as the viscometer) later used in synthetic rubber plants. Today, the U.S. synthetic rubber industry reports more than $4.5 billion in annual shipments, and the nation exports substantial amounts of these materials. 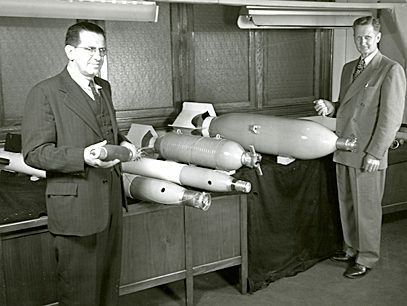 NIST’s Harry Diamond (left) holds the 81-mm mortar shell with the mortar fuze mounted on the nose. NIST helped the Allies win World War II by assisting with numerous military projects, most notably the design of two early "smart" weapons systems. One was a fuse that exploded a projectile when directly over its target, rather than on impact, making the weapon five to 20 times more effective. The "radio proximity fuse" designed by NIST was a tiny radio transmitter and receiver about the size of a light bulb, powered by batteries or generators. Variations on the device were designed for rockets, shells, and bombs. Hundreds of workers spent several years perfecting the technology, first tested in early 1941. The fuse, often described as a leading technical advance of the wartime period, was not released for general use until 1944. Mortar shell fuses did not go into full production, but fuses for rockets and bombs went into full production and were used extensively. The first major combat use of the fuse was during the preinvasion bombardment of Iwo Jima in 1945. Some 8.3 million fuses were produced. NIST also helped design and construct the Bat, the first fully automated guided missile ever used successfully in combat. In addition to coordinating civilian agencies' work on the Bat, NIST worked out the aerodynamic and stabilization characteristics of the 454 kilogram (1,000 pound) missile, which emitted shortwave radiation and was guided by the radar echoes of the enemy target. In addition to its self-guidance capability, the Bat was known for its long range, high accuracy, and high payload. It was used in the Pacific theater.